We’re on a mission. Next stop, China! China has over 160 cities with 1 million or more inhabitants – 24 of these are some of the largest cities worldwide. It is the world’s most populous country, with a staggering 1.35 billion people, of which 700 million live in cities. As this figure continues to rise China’s urban challenges around energy consumption, urban mobility, as well as energy and water infrastructure are becoming ever more evident. This provides numerous opportunities for innovators and entrepreneurs with smart city solutions. 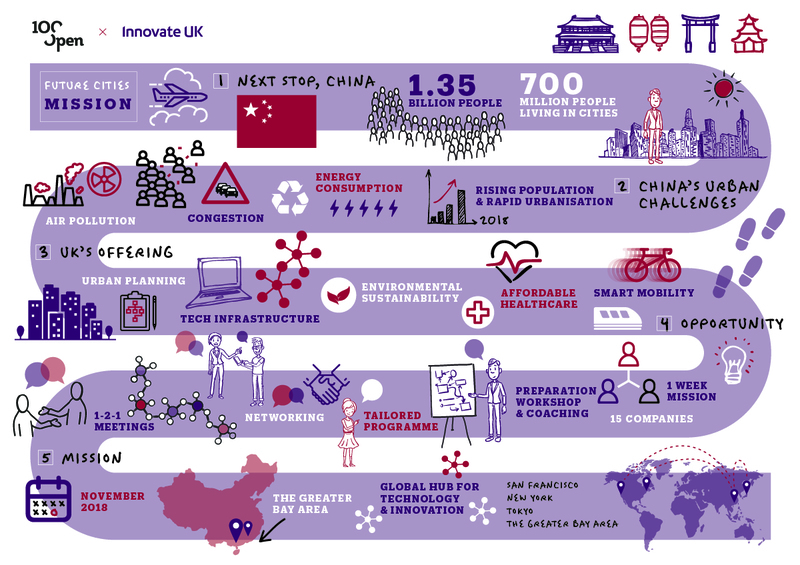 This year, 100%Open are working with Innovate UK, the Department of International Trade, the Future Cities Catapult and the China-British Business Council to deliver a one-of-a-kind entrepreneur mission to China. The mission will highlight the wealth of opportunity for UK companies in China’s Greater Bay Area – a cluster of 11 cities across the Guangdong – Hong Kong – Macau region. As Asia’s most dynamic region, it’s developing into a global hub for technology and innovation and has the potential to grow into a world-leading economic centre to rival Tokyo, San Francisco and New York. The UK cohort will visit Shenzhen which sits within the Greater Bay Area – the centre of technology for Internet start-ups, including Tencent and Huawei. Once the makeup and objectives of the delegation are confirmed, a bespoke mission week programme will be designed which may also incorporate other cities such as Zhuhai, Zhongshan, Guangzhou, Dongguan, Wuhan and Hefei. We are offering up to 15 UK companies with a unique opportunity to benefit from a tailored and supportive mission programme in November, consisting of high-level presentations, discussion sessions, pitching and networking opportunities and site visits. Participants are supported prior to the trip at a readiness workshop, through 1-2-1 coaching and work with our regional teams to carefully curate individual meetings too. 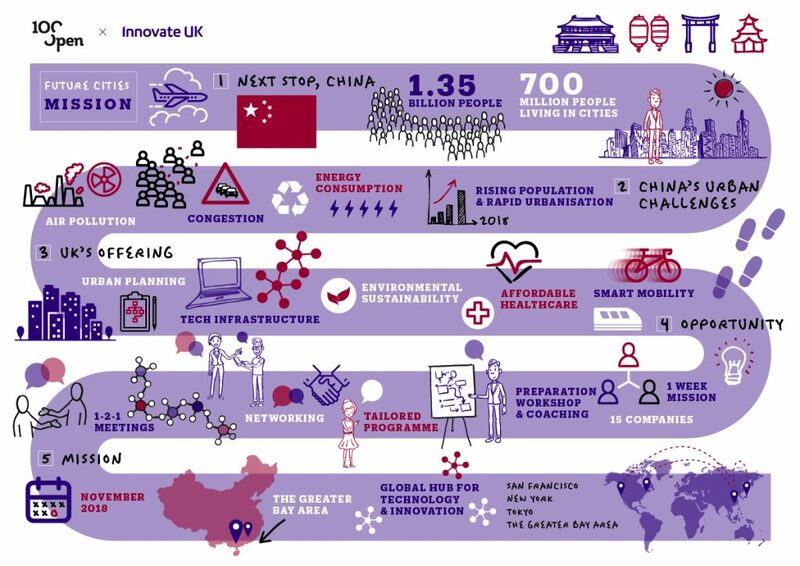 This will be the fourth of Innovate UK’s Future Cities missions that we have had the opportunity to work on over the past two years. Previous mission programmes in Malaysia, Singapore, India and Australia have been very successful, with participants from the Australia mission alone reporting accumulated potential value of new export business at just under £200 million – companies had an average of 10 formal 1-2-1 business meetings and a further 10 pitching opportunities during the trip to Melbourne and Sydney which resulted in approximately 4 potential partnerships each. If you are interested and think you fulfil all of the necessary criteria then don’t miss out on this fantastic opportunity to innovate at the heart of global innovation in and around cities. Register your interest and submit your application now. For more information please contact Kadir at futurecities@100open.com or click here to be taken to the online application platform. Applications must be received by Friday 17 August 2018. I was part of the UK DIT Delegation that spent a week in Shenzen in March 2016 in order to discuss the building of a “TechHub” for UK Chinese startup collaboration. 35 of us and a larger contingent from China worked dilligently (for nothing) and produced a great resultant design. This Jumpstart initiiative was to deliver George Osborne’s promise to Preseident Xi following his UK visit. The Chinese put up significant funding to take it forward together with offering Government hosting facilities. The UK contribution was derisory. I received Messages from the UK Minister Counsellor asking if I could lobby the Treasury for suitable funds. Nothing resulted but ARM stepped into the breach to help UK save face. They formed the ARM Accelerators and subsequently ran a set of startup competitions for UK Startups to go on visits to China to learn and launch. We hosted the Chinese ARM team at UCL while they selected winners. I only kniow of 2 companies that benefited from the whole exercise. I have invitations from regional Chinese ministers in 3 cities to go and work as a consultant on IoT and Smart City projects but no funding is offered. I wished to take part in the InnovateUK Guangdong UK Joint funded competition last year but as I was in Guangdong (with Ministers and potential partners) the InnovateUK website would not let me register. I tried 3 times but it was only when I returned to the UK that I could register but the application date had passed…. I would like to apply for this opportunity but I am very sceptical about the level of support being offered. Many thanks for taking an interest in the Future Cities Mission to China, but also for sharing your feedback and concerns with us about past missions. We have passed on your comments to Innovate UK and our partners at DIT and will email you separately about this. • Participation in an ‘international readiness workshop’ in the UK (outside London) where you’ll be introduced to Chinese market conditions and projects, collaboration tools and open innovation models. The accommodation and catering will be provided by the organisers. We hope that this answers your question, but if you have any more queries about the mission please feel free to contact Kadir at +44 (0)203 889 556.